Good morning church. It’s great to have you out this morning. Thank you for choosing to worship with us. I just want to thank the worship team for some wonderful music that we could worship the Lord with this morning. Thank you so much. I’m just so grateful for that, for the team and the countless hours they pour into ministering to us, and so we may be able to lift our voices to the Lord. For those of you who don’t know me, my name is Jared Clark. I’m a member of the leadership team here at Alpine Bible Church. 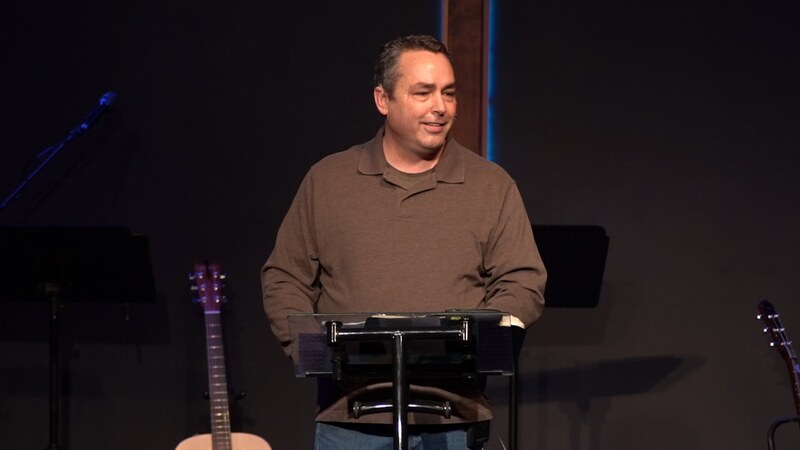 Our senior pastor, Nathaniel Wall, he had a death in the family last week, and he and his family traveled back east to attend the funeral yesterday, so I just, if you would continue to pray along with me for God’s comfort and peace to be upon them and traveling mercies as they return home this week. I greatly appreciate that. The good news is, if you don’t like my preaching this morning, next week, Lord-willing, Nathaniel will be back. All right? I just want to welcome you, the visitors that are here this morning. We’re grateful that you’re here. Hope that you got a green bag or a welcome packet. It tells you a little bit about our church and what we’re all about, and if you have any questions, please feel free to flag me down or anyone at the front door there. We’d love to encourage you any way we can. Last week, we finished up the series in Daniel, so I’m thankful for that. I don’t have to preach on Daniel, I’m very thankful for that. Instead I’m able to preach on something that’s been on my heart lately. That’s the importance of body unity. It’s just so important that we all, as a body, understand the importance and what that means, and so that’s, as a member of the leadership team here at church, that’s a constant prayer when we meet. We send up to God, that God would help us in being unified here at Alpine Bible and the message that we preach, to be unified to the lost and dark world around us. So that’s always something that’s on our hearts here at the leadership team, but also I’m a member of the missions team that will be traveling to India here in a couple of weeks. Unity has obviously been on all of our minds. We have several different people from different backgrounds, different upbringings, right, all going to be traveling in very close quarters with one another, all working and laboring in a foreign land. Obviously the concern for unity is of utmost importance. This passage of scripture that we’re going to be in today, the Apostle Paul really speaks on unity and hope, two key ingredients that we all need to keep our eyes on as a church body, and I hope that it’s been just a blessing to me the last few weeks to just kind of camp out here and just mine the riches of what Paul is saying here, through the inspiration of the Holy Spirit. What a great prayer right? We can just end right now. How’s that prayer right? No, there’s a second one. “Now may the God of hope fill you with all joy, and peace and believing,” this is in verse 13, “So that you will abound in hope by the power of the Holy Spirit.” What wonderful prayers that we see here, so you can see that the importance of body unity, building unity within our body, was not only important to us but it was important to Paul. We just want to, before we get going here, we just want to make sure that we have the correct context and background in which Paul’s writing this letter to the church of Rome, so we don’t … The danger is if we’re kind of parachuting into the last half of this book, of this letter that was written and so we don’t want to take anything out of context. We got to provide a little bit of background. A whole lot more would be best but we’re short on time so I just want to provide you a little bit of background. The Apostle Paul wrote this letter to the church at Rome. Rome was obviously the center of the Roman empire. As, just as the influence of Rome began to spread throughout the world, as the Christian church began to spread, the influence and importance of the church at Rome began to increase as well. This church most scholars would agree, that it was started by people that had come down, Jews that had come down from Rome on the day of Pentecost, to Jerusalem to participate in what was called the Pentecost. It’s this celebration, a week of the harvest, or a festival of the harvest or a festival of the weeks is what it’s called. They would all come from all throughout the known world, the Jews would come down and they would meet there and gather there and celebrate and do this festival, participate in it. This is where in, if we look to Acts 2, it says where Peter, right, stood up in the midst of all these people from all throughout the known world and preached this just amazing sermon. The Holy Spirit came down, right, and many were saved and believed and were converted and were called out of the world and into Christ’s body. The church was begun on that day. The Greek word for church is ecclesia. It’s the called out ones, and so we see that, as the message of the gospel was preached, those who hear and understand and turn and abandon their previous ways and turn to the gospel of Jesus, are adopted in and called out of the world and into this body, Christ’s body, which is the church. It’s an amazing thing that happened there. Then those people went back to Rome, and so most scholars would agree that those people that were saved there, at Pentecost, went back to Rome and established this church. We see Paul here, writing this letter to the church at Rome. So Paul didn’t start this church. It was started kind of from the ground up and he had a, as you read the letter, just a really great desire to want to go and visit this church and be with them. It seems as if there was no apostolic teaching going on there. They all went back and they were a church and they were claiming the name of Jesus and they were walking in the name of Jesus but there was really no apostolic teaching that was going on. Paul was hindered. He couldn’t get there. He’s writing all this and explaining this in this letter to the Romans. So what he decides to do is instead write this letter. I’m just so grateful for this letter. This, what we call the book of Romans, is just a superb, systematic presentation of the gospel. So here’s this church, trying and striving after Jesus, and Paul’s concern is, hey we got to make sure that all these people who are coming in to Rome where the world was meeting in the center, the Jews and Gentiles, they were, the gospel was going out and people were getting saved, we got to make sure the gospel message doesn’t get watered down. See what is evident as you read the book of Romans is those Jews that went back and they established the church, but as the gospel message began to call out, people were beginning to believe and they began to join this church at Rome, right? That these would be not only Jews but Gentiles. These people were coming from all different nations and different cultures and different backgrounds and different upbringings. They’re all coming under one roof. You could see the potential for things to get a little messy, right? So Paul is demonstrating here that it’s for both Jew and Gentile, and most of the first 11 chapters of Romans. He’s claiming here in verse 1, “Now we who are strong ought to bear the weaknesses of those without strength, and not just please ourselves.” He’s building off of what he was teaching in chapter 14. You can just imagine all these different people coming in under the church and all having things that they’re still grasping onto and not quite understanding the full message of the gospel. There’s some that are really strong in the faith, but there are some that are weak, right? So Paul addresses this in chapter 14. I got to be careful because that’s a whole other sermon in itself, but I do want to provide you the background of why Paul writes this in verse 1 of 15. Right? There’s strong Christians, and so Paul refers to strong and weak at this church at Rome. There’s two options. The weak could have been Jews who were always following the Mosaic law and keeping all the ordinances as far as what foods they could or could not eat, celebrating the festivals when they were supposed to, trying to be as, living out their Jewish traditions as best as they can, to please their God. Then they encounter this message of Jesus as the only way, as the messiah, as the only means of salvation and it’s not of works, but it is of what he’s done on their account. So they abandon that, but there are some that are still holding on. They think by celebrating a festival, they might worship Jesus in a better way. They want to pay tribute to him in that way, all right. Or they refrain from eating meat out of their love for Jesus. Right? Then there’s some who say, no. It’s not about the law anymore. It’s about what Jesus has done, and so I know that I don’t, I can eat whatever I want. Everything is clean in the eyes of the Lord now. We see these different perspectives going on here. It also could be, the second option could be the Gentiles who are saved. They proceed out of a pagan culture who worshiped idols and made meat sacrifices to idols. So if you were steeped in that and you heard the gospel of Jesus Christ and you turned from that and you embraced the God of the scriptures, and you went to church and someone sat down a slab of meat that they bought at a cheaper rate because it was a sacrifice to an idol, right? Would that tug at your heart? I don’t want to participate in that. I used to worship that god or that idol. I don’t want to touch it, so it could be two of those things. It could be one option or both options. Don’t really know, but Paul is referring to strong and weak. We’re all, it’s under the basic understanding that we’re all coming from different perspectives. We all have different hangups, and what Paul’s saying in Romans 14 is you shouldn’t be judging each other. You shouldn’t be having cliques over here and cliques over there, those who abstain from meat, those who partake of meat. Right? The goal is to be unified. You shouldn’t judge one another. Paul’s laying out and we can know that whatever is going on, it wasn’t an essential of the faith. These are what we call non-essentials, and we know that because in other letters, like the letters Paul wrote to Galatia or the Colossian church or the Corinthian church, if there were things that their church were doing that were outside the essentials of the Christian faith, he was sure to address them and he would call them out on it, and say this is a false gospel. This is not why Christ has come. You can read those letters and you can see that very clearly, so we know whatever’s going on here, at the church of Rome isn’t that essential doctrine. It’s some non-essential stuff that was going on, and Paul says don’t be judging each other over it. Work to be unified. That’s what he, where we come into verse 1. “Now we who are strong ought to bear the weaknesses of those without strength, and not just please ourselves.” Paul’s talking about not just putting up with someone who doesn’t believe the same way. He’s not saying, look don’t judge them, but at the same time he’s not saying, and don’t ever talk to them or interact with them, right? What he’s calling us to is something higher. He’s saying we ought to bear the weaknesses. Bear means to pick up by a weighty thing that needs to be picked up. We need to come alongside those that are weak, those that have those hangups and not just not judge them or keep them isolated but what he’s calling us to is a life to serve them and to walk alongside of them and to bear their burden and to disciple them. It goes on in verse 2, “Each of us is to please his neighbor for his good, to his edification.” That’s the difference that a Christian should manifest, right? Out of our love for Jesus, we’re seeking to serve those around us, not to be, have higher favor with God but because of what God has done for us, and Paul touches on that here in this text. It’s about our neighbor, for building our neighbor up. Even the person that might have offended you, or even the person that you just can’t stand being around, those are the people that God’s asking us to go to, and not just put up with them but walk alongside them. Bear their weaknesses with them. It’s not about pleasing ourselves. He goes on verse 3, “For even Christ did not please himself.” That’s the heart motivation that we all need to grasp onto here. We can’t serve others and do all these things. We can’t go home, going I just need to work harder and try to better a job at being friendly or connecting in the church. I need to … What Paul’s saying here is first we need to understand our motivation for it, and what is the motivation he provides for us, for even Christ did not please himself. Christ, according to Philippians 2 and numerous other passages in the New Testament, stepped into his creation and became in the form of a servant and he went on to live the perfect life, to live the law out completely so that he might be the spotless lamb of God who would go to the cross and take on our sin. That the wrath of God would be poured out on him on that day, instead of us. Christ wasn’t about himself. He was about us. Paul’s asking us, as he’s asking us to bear the weaknesses, we have to remember what the motivation is, what Christ has done on our behalf. He goes on in this verse to quote Psalm 69:9, “The reproaches of those who reproached you fell on me.” This is a messianic psalm. The Psalms were written about 1000 BC, before Christ was even born, and Paul is demonstrated the Jesus the Christ, the messiah has come and he has fulfilled this prophesy, this messianic psalm. Paul’s doing something else. He’s beginning to build an argument here. It’s an argument that he uses to springboard into the demonstration as to why us as believers, the church at Rome and even us today, can all unite around the object of our hope. So he goes on here in verse 4, “For whatever was written in earlier times was written for our instruction, so that perseverance and the encouragement of the scriptures, we might have hope.” He used psalm 69 as evidence that Jesus fulfilled this messianic psalm and he’s beginning to instruct to us as believers why we can have hope. For whatever was written in earlier times was written for first our instruction and that as we look and peer into God’s redemption story, that is laid out in scripture, we can have perseverance in those hard times. We can have encouragement as we look how God is fulfilling what he’s promised to do throughout human history and they can provide us hope as we do that. I’m so grateful for the scriptures. I spent my early adulthood, just living for me, trying to satisfy my desires. Anything that the world would give me, not wanting anything to do with God, but just pleasing me. As I began to get older and into my teens and as I left high school and had that identity crisis of who am I, what am I here for, what is the purpose of life, all those things that I had tried, were just vain and hollow. I went to college and tried to buy into their evolutionary theory and God doesn’t exist and God is dead, and how silly people are to think that way. This world can be demonstrated in science, and I tried to buy into it as best I can, but thankfully, I had the opportunity to go … I was a river guide in high school and college and rafted, white-water rafted all over the west, and had an opportunity to go on a 21 day trip down the Grand Canyon. It was the most, just, early 20s, it was just a splendid time to be down there. That’s where God began to reveal himself to me. He revealed himself to me in his general revelation it’s called. Psalm 19:1 says, “The heavens are telling of the glory of God, and their expanse is declaring the work of his hands.” I was down there, in the bottom of that crack. I didn’t have any distractions. I couldn’t just flip on my smartphone and start watching YouTube. I couldn’t turn on a TV. I couldn’t go to town and have dinner at the restaurant, and fill my belly, right? I was just down in the bottom of this crack in the earth, forced to look at this just marvelous creation. At night, it was like a kaleidoscope. The stars would, because of the narrow walls of the canyon, the stars would appear on one side and disappear on the other, and all night long, stars just rotating. My mind would go how many stars are up there? This happened by chance? I would see just the perfect order in nature and how everything, the ecosystem was designed, and I’d say this is certainly designed by something or somebody. This didn’t just happen by chance. Paul even mentions general revelation in Romans 1:20. He says, “For since the creation of the world, his invisible attributes, his eternal power and divine nature have been clearly seen, being understood through what has been made, so that they are without excuse.” I had 21 days to observe that, and I floated out of that Grand Canyon into Lake Mead with no excuse. There was a creator. I had to come to that conclusion and that’s what his general revelation points to. All people are without excuse in that regard. The problem comes as God’s general revelation doesn’t tell me who he is or how I have relationship with him or how I can be reconciled to him, if that’s what needs to happen. Those things don’t appear in general revelation. It began a journey. I floated out there, purposed to have a relationship, or find this God, and I thought it would be in a works based religion, and so I went and devoted my entire being to trying to do this list of things that I had to do in order to be accepted by this creator and this God, only to always fall short. Only to, I just remember those mornings, just walking in, putting on my tie, knowing the ugliness that was going on inside of me and having to pretend like everything’s good on the outside, that I had some type of worth to offer this God. It just became overwhelming, and I just had to abandon that. I desired to have relationship with him, but if it depended on me and what I had done, then I just couldn’t do it. I could be a lot of things but I can’t be a hypocrite. I just moved on and I began to, again, got a good job and had lots of money. I was just trying to put everything into this big void in my heart that this world had to offer. It led to nothing but despair and emptiness. Those late nights, looking at myself in the mirror going, you have no purpose. You have no meaning. That is, until I told the group this morning in the first service, my 10 year old said, “You’re going to do good today Daddy,” this morning at breakfast. I’m like thank you honey. She goes, “Just don’t cry.” So I’m being strong for her. I’m going to be strong for you. A Baptist preacher who had a heart to plant a church in Cedar City Utah moved in across the street from me and he began to share the gospel, the good news that is found in scripture, God’s special revelation. It had the answers of who I am, what I was made for, what my purpose in life was for. It also had the answers of this chaos, that what’s going on in this world … It was right after September 11th, and you remember how the country was just shaken to its core. In that moment, I was there, and this book entered my life. This message of a redeeming gospel and who this creator was began to be shared with me. Not only who I am and what I was but what was going on in my heart. According to Romans chapter 3, I can’t do enough good. I have no righteousness that can make me pleasing in the eyes of God. All have sinned and fall short of the glory of God, according to Paul in Romans chapter 3. But the good news, there is good news, Jesus Christ came to pay that penalty for you and for me. The good news of Jesus Christ, God’s redemption story is found in the scriptures. All we have to do, thankfully, all we have to do is turn from our way of doing things, abandon our hope and what we placed it in, and turn to the Lord Jesus Christ and his accomplished work on the cross, and believe and trust in him. That’s the message, the good news of the gospel. The bible, Nathaniel said it last week, is a collection of 66 books written by 40 different authors on three different continents in three different languages, over a period of 1500 years, yet it is one consistent and unified story. So thankful for the scriptures, that I can know who God is and I can know how I can have relationship with him, through the gospel of Jesus Christ. Look, it’s even more, according to verse 4. It was written for our instruction. You want a roadmap to get through life, to navigate through the difficulties and the sin and muck and the mire of this world, turn to the scriptures, and as we do so, Paul says here, it provides us perseverance, patience and encouragement, in the most difficult times of life. I know many of you are going through many struggles in your life right now, and God’s given us a means in which we can connect with him, and I hope that you can see what a great gift the scriptures are, that we can turn to him, and as we see what God is doing in scripture, we can have hope because what he’s doing is he promises, like in Psalm 69:9, he promises a messiah, and then he fulfills his promise. We can have hope and we can trust in him because of his faithfulness. We go on here and we come to our first prayer that Paul gives in verse 5 and 6. It’s my first prayer for you and for us this morning. It says, “Now may the God who gives perseverance and encouragement grant you to be of the same mind, with one another according to Christ Jesus, so that with one accord, you may with one voice glorify the God and Father of our Lord Jesus Christ.” This is Paul’s prayer for unity for the church. How important it is as a church body, as a group of called out ones to be unified in the message of the gospel. Paul goes on in Ephesians. He writes to the church at Ephesus and he repeats this same desire of his struggle in wanting the church to be unified. He says in verse 2, “With all humility and gentleness and patience, showing tolerance for one another in love, being diligent to preserve the unity of the Spirit and the bond of peace.” Why is it so important for us to be unified? I went to bible college at a later age, in my late 30s. Family, extended family thought I was crazy, pulling my kids out of school and taking them down to California and going to bible college. I’m pretty sure they thought it was a mid-life crisis, whatever, but we went down there and it was just a great time. Did a lot of healing. Did a lot of learning in bible college. The one part that was just kind of a burr in my saddle was the general education requirements. They have the requirements for, I was doing biblical studies and biblical counseling, so I was taking those classes. Was loving it, right? Getting in God’s word and mining out its truths and all that stuff, but they had these general education requirements, these classes that you had to take, the [inaudible 00:27:53] stuff that made you a more well rounded person or individual. I put those off, I did some of them in my younger years, but I put the ones I really disdained the most off to the very end. I had to take those while I was in bible college, and one was math. Then the second one was music appreciation. I am from the sticks. Give me a good country song, right, we’re good. That’s music. Not this Beethoven, Bach stuff. So I had to sit through this class and learn all the instrumentality of the whatevers, orchestra this, and part of the requirement was that I had to go and listen to a symphony and then write a paper describing my experience and how the sounds and did this and that. I put it off til the very last minute and finally, out of desperation, I started Googling and I found the LA Philharmonic was going to be playing Beethoven there in downtown LA. I also heard from a fellow student that if you go and show your student ID that you’ll get like a $5 ticket. I’m like, sweet. Won’t cost me much. I’ll just get in there, get the cheap seats. It will be good. I even did my due diligence. I went online and I said what do I need to wear? Do I need to wear like a tie or tux? It says just come as you are. So I came with slacks and a collared shirt. Well, someone messed up. Either the person that gave me the ticket or the computer, they gave me like up front, middle seat, like in the midst of all these Hollywood elite people, all dressed out, decked out, full tuxes, full everything, and here I am walking in with collared shirt. They’re looking at me and I’m like I’m a college student. Yeah, 38 years old college student. Trust me. So I just felt completely out of place. So I sit down and everyone, there’s a mumble of the crowd and all of a sudden the orchestra comes out and they seat and it starts to quiet down a little bit. Then the conductor comes out and it becomes very quiet and he stands up to the podium and he, I was supposed to Google whatever that little wand was, in between services. He grabs the wand, right, and everyone’s quiet. I’m observing all this and I can see, because I’m in the front that all these people are from different nations and different cultures and obviously different upbringings. I could deduce, and that all, they were all there, right, to play Beethoven. The conductor began, and as they began to play, all these different instruments, ranging, you guys know all the different instruments that are in an orchestra. They’re crazy but they’re all different but they all began to play this one harmonious, beautiful composition by Beethoven. It blew me away. Here’s this redneck from the sticks, and I am like captivated by this message that Beethoven has written and these people that have come together with diversity of cultures and backgrounds and stuff and of all, in one harmonious movement began to play this just beautiful song. It was amazing. I was blown away. Just a caveat to this. Did you guys know that composers, they write like pauses, like for dramatic effect in the middle of measures. You’re not supposed to clap during those pauses, just so you know. I was so carried away. There’s this pause I’m like, what, yeah! Just started, and all of a sudden all this hissing and stuff, they’re all staring me down. I’m like sorry I’m going back to the sticks shortly. Yeah. Just wait til everyone else starts clapping, those that are sophisticated and know these things. All right. Yeah. Yeah, I’m that guy, so I’m sure everyone that’s going to India with me are like really confident of my abilities by now. So anyway, but it was beautiful. Now imagine for a second if that, the first chair violinist decided that he didn’t want to play the same tempo as the conductor wanted the orchestra to do. Just in their own desire, they just started playing a different tempo. And say the french horn section, you know what, they’ve been talking about it for weeks, that they are sick and tired of being upstaged by the violinists and the stringed instruments, so when they hear the first violinists going, they’re like now’s our time, and so they all run and they run around and they put their chairs in front of the first string violinists and they start doing their thing. Right, so they can have their 15 seconds of fame and say look at me! Then the flutist, flutist, is that right? Probably not. I was supposed to Google that too. Whoever plays the flute, she’s sick of tired of never being heard, or he, of never being heard. I’ve never heard of a flute when they, I can’t hear it but I guess you can hear it if you have the ear. But she gets sick and tired of not being heard so she gets up and she takes somebody’s trumpet or something and she starts playing because she wants to. In the meantime, the majority of the symphony are just trying to follow the conductor and do what the conductor’s asking them to do. Do you think that beautiful message is going to get a little muddied? People are still looking on the outside and they’re seeing a very confused message now because they’re no longer in unity. I think it’s the same for us, church. We should strive to be unified, as Paul says in verse 6, “So that with one accord, you may with one voice glorify the God and Father of our Lord Jesus Christ.” It’s about his glory, and if we don’t pursue unity, our message becomes muddied. It’s not with one voice. We should all strive to glorify the God and Father of our Lord Jesus Christ, and so Paul ends his prayer and he goes on for instruction here in verse 7. He says, “Therefore,” so it’s a concluding statement here, because of this, “Therefore accept one another.” We see here how Paul has first identified the source in which we can change, right, in this prayer. Now the God who gives perseverance and encouragement grant you to be of the same mind with one another, according to Christ Jesus, but we also see in verse 7 that it’s not about just letting go and letting God and being passive about it. We, as we understand that the God, the Spirit who enables the heart or indwells the heart of the believer can enable us to do these things, Paul’s then asking us to step out and actively pursue it. Therefore, accept one another. That’s the hard part, right? Someone’s just completely destroyed you or hurt your feelings. You don’t want to have to ever talk to them again. Someone’s, maybe you need to apologize but you just can’t find it in your heart to ever bring, admit that you were wrong. All these things, this is where Paul is saying, hey, yes God will enable you. God will grant you the power to do this, but you must step out. You must do your part. It’s a cooperative heart with the Holy Spirit. Therefore accept one another. Again, he reminds us, and this is so important church, of our motivation for doing so. Just as Christ also accepted us, to the glory of God. Why should we do it? Well as I mentioned earlier, I’m so glad that as the message of the bible, this unified message began to be shown to me, I remember the moment I accepted Jesus in that small Baptist church in Cedar City, Utah, where I was new. I was under conviction of my sin. I’d always had that, and I knew I had to do something, right, to get that reconciled and get that all worked out with God. I remember thinking, well I’m in a Baptist church so I must begin thinking about getting baptized, right? So my mind automatically started going to these things that I’m going to have to do to earn God’s merit and favor, but the good news is Jesus will meet you right where you’re at. You don’t have to do all these things to have this relationship with you. He died for you. He took that payment for you, so that you don’t have to earn it. You can’t earn it, according to Romans chapter 3. Jesus did it for you. All you have to do is believe and trust in that good news, that gospel message and follow Jesus. Turn away from the things we used to do and turn to the living God. Turn away from the idols that we place in our life, that we lean towards and just turn to seek and please the living God who has died for us and paid the immense and eternal punishment on our behalf. As we accept that, as we understand that, Christ met us where we’re at. Paul’s saying here, as you turn to accept one another, don’t put stipulations on them, before you give them acceptance. Just as Christ also accepted us to the glory of God, we didn’t do anything to deserve it. We didn’t merit anything. He did it for us. Paul’s saying just as Christ did this for you, now accept one another. Don’t give them a laundry list of things they must do before they’re accepted into the brethren or whatever. We got to just make sure that our motivation is that, what Christ has done for us, and then in turn, we turn and walk alongside one another. We, with God’s strength, begin to accept one another and bear one another’s burdens and walk along with them. As we do that, we do it for the glory of God. We become unified in doing so, with one accord and with one voice, for God’s glory. Verse 8, as we go one, “For I say that Christ has become a servant to the circumcision on behalf of the truth of God to confirm the promises given to the fathers and for the Gentiles to glorify God for his mercy. As it is written, therefore I will give praise to you among the Gentiles, and I will sing to your name.” Paul is again referencing the Old Testament. Again we’re imagining an audience that is both Jew and Gentile alike. It looks like there might be some schism there and some cliques going on, and so Paul is trying to say no, wait a minute. This gospel is always not about, not just about the Jews, but has always been about the Gentiles, for the world. It’s always been God’s aim and God’s measure. So like a skilled lawyer Paul is pointing back to this specific revelation that God has allowed to be recorded throughout human history, as a means of proof that, number one it’s both Jew and Gentile. He’s always had the Gentiles in mind, and number two, God always fulfills what he has promised in the past. The Torah was committed to writing around 1300 BC. The book of Psalms was written around 1000 BC. The book of Isaiah was written in 700 BC, yet they all point to this one messiah figure who would come. Paul uses the three main subdivisions of the Tanach, of the Jewish Old Testament. Those are the law of Moses is the one major subdivision. There’s the writings, right, which are the psalms and proverbs and certain things like that. Then there’s the prophets. Paul uses each one of those major subdivisions that a Jew would know, and saying see, it’s never been all about the Jew. It’s been about the Gentile as well. In him, shall the Gentiles hope. We can find hope and encouragement in knowing that God is faithful in what he has promised. God is faithful. Because of that we can have hope, as we put our trust in him, and in his promises. Let me move on here to Paul’s second prayer this morning. Verse 13. Again it’s my second prayer for us as well, church. “Now may the God of hope fill you with all joy and peace in believing so that you will abound in hope by the power of the Holy Spirit.” What an amazing prayer. What a reminder to know it’s not about my doing. It’s not about my strength. It’s not about me picking myself up by my own bootstraps. It’s about the power of the Holy Spirit doing a work inside of me, from my ugliness to the transformation that happens from the inside out, of becoming more and more like Christ as I have looked to him and leaned to him and learned from him and communed with him in scripture and in prayer. It’s not about how strong we are or how faithful we are, but it’s about how strong and faithful our God is. We can have hope in him because he who has promised is faithful. We can trust in him. So, as we wrap up this morning, I just want to do something a little different. James talks, the book of James talks about being hearers of the word and not doers. So I just want to provide us an opportunity as we go to prayer, that each of you might, just have some quiet time that you can have some time for your prayer for unity. That you would ask God to grant you the perseverance and encouragement and strength to pursue unity in this church body or in your connection group or the missions team because we know it comes from him. The second prayer that you might do this morning is your prayer for hope. I got to admit, I’ve been walking with the Lord 14 years now, and it seems like I’m doing fine, and then all of a sudden I just find myself full of anxiety and fear and in my flesh and just working really hard and being exhausted mentally and spiritually and I just come and find myself not having my hope in what I need to be, in my Lord. Not gaining or garnering or pursuing the enabling grace that he can give me as I look to the power of the Holy Spirit to do that with inside of me. My daughters, their grandpa, Teri’s dad is, he’s an old cowboy. I guess he did this with Teri and her sisters too. He’s got an old bench seat truck and he’ll be driving down the road and he’ll just, with big strong hands, he’ll reach down and grab their, just above their knee and he’ll just start squeezing and he won’t stop until the girls say big girl, big girl, big girl, and then he’ll stop. I just think as believers, that’s kind of what we have to do on a consistent basis, where we are just fighting and struggling in our strength and our own power, and God has to bring us to the end of ourselves, where we just say … Well I guess big girl won’t work for me. Uncle. Uncle. I give. Lord I can’t do it. I can’t do it on my own strength and power anymore. I know all this, but here I am, in my own strength and power. I give. Uncle. Help me Lord. So my prayer, as we have the band come up this morning, is your prayer for unity. Just spend some time with the Lord, asking for his enabling power in that. Asking him for the joy and peace as you believe and trust in his promises that’s promised there in verse 13, and that we might abound, right, abound in hope because of who God is and what he has promised. I just want to say, if you’re here this morning and you’ve never had that saving interaction with Jesus where you’ve abandoned what you thought was good or thought was right, whether that’s works based religion or just being good or whatever, and you hear this message and the Spirit of God is convicting you of its truth, the good news is you don’t have to do anything other than turn to him. He will meet you where you’re at. He’s a loving God. He’s given us this precious gift of salvation and all you have to do is swallow your pride and turn to him, and he will save you. That’s his promise to us, and I testify of its truth.